I offer this as proof that drinking is amazing. 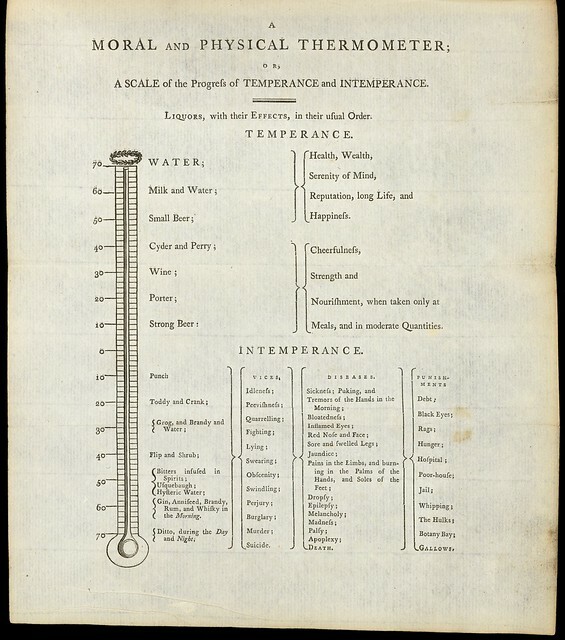 The Moral and Physical Thermometer concept was first published in the early 1800s - specific dates are conflicting but it was closer to 1812 - as part of the first catalog for the characteristics of alcoholism. It had a few other incarnations, namely tis one (which is far better illustrated than [the original]), that purported to indicate the various goodness of Enlightenment Era drink. The idea being that one would be better served keeping their consumption of alcoholic beverages towards the top of the thermometer. Why water hits a temperature of 70, I can’t really fathom why the numbers are what they are. The original version appeared in a treatise entitled An Inquiry Into the Effects of Ardent Spirits Upon the Human Body and Mind (Ardent Spirits would be a great band name), written Benjamin Rush (another Benjamin!). Rush is a pretty fascinating person. He, like my man Franklin, was a signatory of the Declaration of Independence, published both the first book of Chemistry and Psychiatry, and he is considered to be the founder of American Psychiatry. Ardent Spirits, though, is attributed to the start of the entire temperance movement in America. The whole pamphlet is pretty fascinating. Rush, at length, identifies traits and phenomena of extreme alcohol inebriation in order to allow for better diagnosis and treatment. But Rush never intended the diagnosis of addiction to become a banner booklet in the quest to prohibition. In fact, Rush pretty clearly states that his is not against alcohol in its entirety in the first paragraph on the first page of the document. ”Fermented liquors contain so little spirit, and that so intimately combined with other matters, that they can seldom be drunken in sufficient quantities to produce intoxication…. They are, moreover,… generally innocent, and often have a friendly influence upon health and life." Rather, like the image above, indicates that there are “good” drinks to be had. Like water. Or cider. Or wine and beer. At the time, alcoholic beverages were genreally safer to drink than water and was the primary liquid consumed on the Mayflower. Rush goes so far to suggest that you can help and addict through the detoxification process by switching them to beer, wine, or cider. ”By the temporary use of these substitutes for spirits, I have never known the transition to sober habits, to be attended with any bad effects, but often with permanent health of body, and peace of mind." I… sort of wonder what terror would include but I actually expect it’s an antecedent to aversion therapy, which is another useful thing used for nefarious means. And I’m pretty sure many of the other treatments will lead to bleeding. And, as an interesting aside and final note, Benjamin’s Franklin death is attributed to Rush’s vocal proponence of blood-letting.